The morning started with the pounding of drums, clashing of symbols and tooting of deep horns. 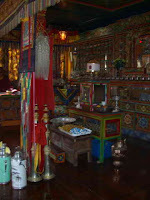 A Puja blessing was in process in the very elegantly decorated puja room on the top floor of Lhakpa’s house. 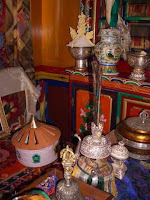 We had special invitation to watch and sample the yak butter tea served in silver containers and the fried sweet dough. The monks were not disturbed by our presence. It was a fitting farewell for our time at Namche Bazar. Lhakpa draped our necks with golden katas. 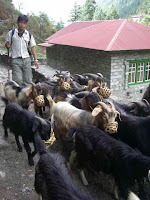 They said the trip from Namche Bazar, so far my favorite place, to Phakding is all descent. The claim is correct. I took a few Ibuprofens just in case so my knees would hold out. There is not much to stop you from rolling off a cliff as you come around a switchback full of loose dirt and gravel. And then whoever built these paths throw before you a couple dozen horrid stone steps that take a geologist to figure out which rock to step on and not lose balance. There were too many trekkers going both directions this day. The descent on tap was at least 7 hours and besides that, there were more and more of those swinging bridges which you had to muscle yourself across before the Yaks took over. All the while below raged the river carrying glacier melt down to the more populated areas of Nepal. Once you get close to the river, its roar follows you like tintinitus in the ear. Of course, by noon time when we stop for the usual Snickers and Sprite snack, rain has started making everything slippery. We dig in the backpacks (this is why backpacks are invaluable) and put on the rain jacket over the fleece and whatever number of layers you are padded with, pull the hood around your head and leave the cap bill out for the rain to drip off of. I want to break down into hollow cries. I’m already burdened with bronchitis and now I’ve got to walk two more hours in this mess. 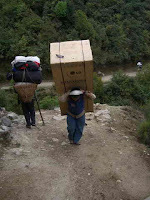 The people traffic doesn’t wane a bit, and porters pull giant plastic hoods over themselves and their load. Life keeps on going without a blink. I keep on trying to get the right step and not lose breathe when I start the upward climbs, which are always there somewhere in order to give you a reason to scuttle back down again. We cross so many of those long shaking bridges - I really get out of breath on those - and a few doubtful wooden ones. I keep telling myself, everyone else made it across, why not me. Once the river had broken down the crossing bridge and our porters with Jeta and Suka, got in the water and lifted big stones and boulders to try to build a stepping stone exit not just for us but for everyone. There was a definite drama at the river. This night, so much further down in altitude, I slept well for the first time, or else I was just exhausted. I was up early because at last we had reached the final day of this branch of my itinerary. Breakfast at this rather dumpy lodge was not good. The toast was like South African Hard Tack and they were out of butter. Remember we’ve had no juice or fruit in more than two weeks. I keep dreaming of papaya at the Yak and Yeti Hotel in Kathmandu. 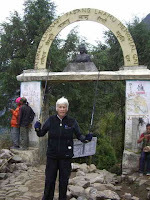 Today, whatever day it is, is the final hike all the way back up to Lukla at about 9000 feet. That’s the airport village, where tiny planes take off going downhill on the runway. Below them at the end is only a deep gulch of a valley and giant mountains all around. These flights are only scheduled for the morning time when the sky normally is clear. I had walked hard and fast because I’m ready to call this trekking done with. I took only one rest stop to get a Sprite and Snickers, and then kept pushing with my two Sherpas at my elbows. It wasn’t that bad of a haul but took about three and a half hours. I sort of amazed myself that I my lungs worked pretty good. We arrived about lunchtime and the hotel is the most elegant yet with hot shower (sigh, plenty of hot water, that’s rare) and proper toilet and even a bit of heat in the room. Of course the toothpaste had come uncapped and squeezed all over my hairbrush, creams and emery board. Alas. At least there is hot water to clean it all up. I began to think back about the things I’ll remember. The hills were higher than the sound of music. The stones were ankle twisting. Yak bells a mantra. (Move to the left and be still as they pass.) The wind risque. The red and gold prayer wheels tempting if they did any good or not; the hostel-like cells colder than ice in a bucket. The meals - well, you better like potatoes, eggs and rice. The stretched muscles never wimped a bit, never cramped, never sore, no blisters on my toes. Milk tea and hot lemon breaks on the trail, especially at the conclusion of the trek, the walking sticks thrown on the floor, the hats and gloves on the seat and Nima always bringing me thick blankets to wrap up in even in the dining area. Backpacks are indispensable for carrying rain gear, water, laptops and Kleenex. The overloaded porters, proper road hogs toting sides of beef, refrigerators, four half inch plywood sheets, or corrugated tin roof parts - (how I don’t envy them in their burden; they stopped as much as I did. But then they had reason.) The rhododendron trees in bloom, overzealous in the moment of beauty. The gold and white silk “katas” wrapped around my neck by friends and lamas for blessings, and also seen on bridges and poles in dining rooms; puja sounds - the horns, the symbols, the smell of incense and yak butter tea (delicious but heavy in fat and salt. 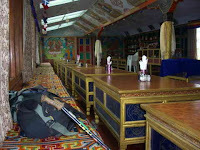 ); the restaurant dining rooms so long by length with special heavy tables painted in gold and with Buddhist art and symbols, in front of wall benches covered in rugs and with pillows for leaning back; the morning Buddhist rituals as a Sherpani singing the Om swings incense through the house. Sherpa women are charming, modest and generous. They take care of us in an abundant way that is embarrassing. They don’t use the word “no more” in their vocabulary. In the Khumba the vista ever includes Everest and its fellow mountains; there are no fruits except an occasional apple (an apple growing project has begun near the airport area); cheese is from the nak (female yak) but is called yak cheese; potatoes are plenty as pennies in a piggy bank; eggs, fried yak meat and Dal Bhaat and extreme hot chilies are most popular. My favorite times were at the home of Geshi Lama getting all sorts of blessings, trying on Sherpa costumes with Lhakpa, and being pampered by Nima’s wife as they served an enormous meal. We met interesting people mostly doing documentaries and trying to get into base camp. And today, when I was so deep in despair because I missed my church, my home, my children, my friends, and I was asking God to give me a boost, I heard to guys talking behind me (you never look behind) in English about ministry. It was as if he had sent two angels. I turned around and said, Bless you. I miss my religion and all the symbols and service and purpose so much and for the first time in a month, I hear Christians talking beside me. There was a group of about ten Assembly of God missionaries hiking the trails beside me. We stopped and chatted and I felt one hundred per cent cured. Silence is ear pounding. Blankets are thick protectors. Hot water is cold and apparently the only salesman to pass through these parts sells Mars, Mounds, Snickers, Toblerone, and Coca Cola products. My old favorite hiking shoes and thick socks served me as well as the fancy stuff, the sticks saved my life. No one cuts flowers for arrangements, but there are plenty of plastic ones stuck in pots of real greenery. The odor of smoke and yak dung burning bites the nose until it is continually running all day. I used more Kleenex substitute than I have in my life. Always runny nose. Always having to blow. That was distracting to the climbing task. The stones are nothing to play with, although people dance up and down them without a breath. I had to lift my leg as high as the Rockettes to get up some of them. 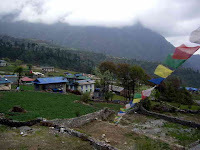 The white chortens and the boulders decorated with Oms and the prayer flag poles you pass on the left side and everywhere, literally everywhere are the red, green, white, yellow and blue Tibetan prayer flags, though you never see anyone changing them or hanging them up. They fly and prayers fly and the blessings of the world are on us all but I believe more than ever in the God I worship. Photos: 1. Puja blessing in process on our final day at Namche Bazaar. 2. Every Buddhist house has a puja room, like a chapel. 3. Yak butter sculpture and other acoutrements of a puja. 4. Goat traffic. 5. would you believe a refrigerator? 6. Rocky made it. So did I - end of the trek. 7. A good dining room at Lukla. 8. Flags at Lukla and airplane taking off downhill.